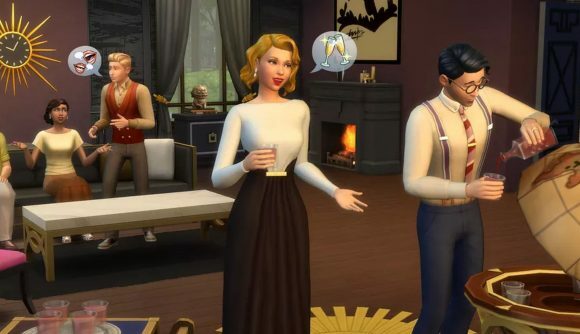 The Sims 4’s upcoming patch lets your Sims become Insta-famous. Ok, Instagram itself might not be involved, but the update will let you turn your sims into influences, themselves molded by the unstoppable juggernaut of The Brand. Traditionally, your sims’ clothes haven’t really had much of an impact on the game. Chucking on any old t-shirt and pair of jeans had the same effect as making sure your Sim was suited and booted at every occasion, but that’s about to change. When the new update (which has been pushed back from its planned release this month) drops, you’ll be able to turn your Sims into Style Influencers. Of course, you don’t jump straight to having millions of followers. At the humble beginnings of your social media career, you’ll be a simple Rag Reviewer, carefully crafting your fashion blog from home. As other characters drop by to visit, you’ll be able to suggest a makeover for them. Those who know you well are likely to agree to your bold new look, but those who you don’t get on with will probably snub your fashion advice. If the makeovers you offer are successful, you’ll start to see your custom fashion trends catch on in the wider neighbourhood. I’m sure that there are people who’ll use this power for good, but personally, only two ideas have come to mind. The first is convincing people to dress themselves up as complete idiots, but the second is potentially more wholesome. I forsee a future in which someone creates a house full of five male Style Influencers, and sends them out into the neighbourhood to make over the most fashion-adverse Sims they can find. This is my chance to recreate Queer Eye in The Sims, and by God I’m going to take it. I can even remake the Fab Five’s iconic Atlanta loft. Also included in the new update will be Sim City-style terraforming. As well as building on a plot, you’ll be able to shape the land underneath it. That’s a feature that’s been in previous Sims games for years, but until now it looked as though it wouldn’t be coming to The Sims 4. Either way, the editor looks pretty detailed, allowing players to raise, edit, and sculpt terrain. All this information comes from the first Maxis Monthly livestream, which took place yesterday. Sadly, however, the latest update has been delayed, and we don’t yet have a new release date – expect the new features later this year.